European Exhaust and Catalyst (EEC) say its 6-in-1 solution helps DPFs to regenerate by reducing the natural combustion temperature required to burn off the trapped particulate matter by up to 150ºC but how does it perform for GW reader and mechanic, Mark Bradbury? Testing the solution out on a 2008 Volvo V70 D5, Mark said the owner had some concern that the engine oil level was rising and feared the DPF was failing to regenerate successfully. The treatment claims to cleanse all of the fuel and emissions system of carbon deposits, helping to improve MPG and engine performance while also reducing smoke and lower emissions. Reporting to GW Views, Mark said: “I would recommend it, I’ve certainly had no negative effects. Prior to treatment, the Volvo’s pressure sensor particulate trap measured seven hectopascals at idle. Post-treatment, the figure has dropped to four. “The diagnostic readings have been really pleasing to see,” explained Mark. One bottle can be used with over 400 litres of fuel, at 25ml shot dosages. Each 25ml shot cleans the injectors, EGR valve, fuel vaporiser, turbo, sensors and assists with regeneration. 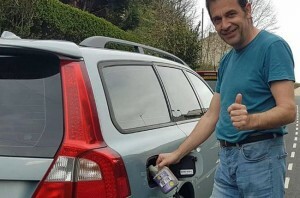 Mark said that he applied a dose to the tank before filling up “to ensure it mixed well” and concluded his review with a four out of five rating. For more information, please call +44(0)23 9224 5300 or email sales@eurocats.co.uk.